New Construction direct oceanfront Mediterranean style residence pairs old world details and state of the art amenities. 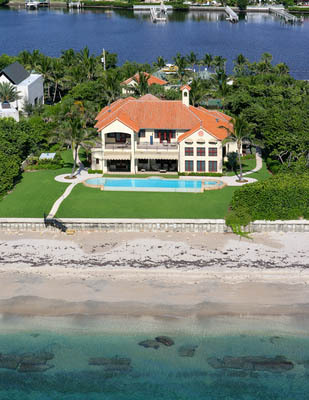 This ocean to intracoastal masterpiece is located in the exclusive oceanfront community of Manalapan, Florida. It offers amazing views of the sparkling ocean and the intracostal waterway. A gated winding drive crosses a waterfall and leads to the main residence while passing the tennis courts and private guest house.